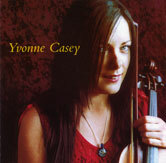 Yvonne Casey is the fiddle player with the famous Clare band The Ceili Bandits--still the best name in the business--and she has just released a solo CD, on which she plays mostly traditional tunes, and a few other "world music" pieces with titles like "Bruca Manigua" and "Ska"--quite in fashion since Sharon Shannon and Mary Custy opened the way. Casey has a unique style, quite effective even though she uses little ornamentation, and a slightly rough-edged tone at times. Terry Bingham, Kevin Griffin, and Eoin O'Neill are among the "usual suspects" joining in. Those who love the music of the Bandits should enjoy this greatly.